Meet all your storage needs with the Honey-Can-Do 60 In. Storage Closet. Here is a great way to add a closet where there was not one before! Sun-Stational Storage Wardrobe. Can be used with or without the wheels. Dust Proof Storage. Extra Storage Space For Garments. Frame is a Strong Metal Frame. Frame for wheels is plastic. Available In Color Blue, Beige, And White. Easy to Assemble. No Tools Required. Size, 48 In. (W) x 66 In. (H) x 18 In.(D). Inner storage to hang clothing, outer storage for shoes, etc. Wheels for mobility. Made from sturdy, rip ressitant, denier fabric. Features: Wheels For Mobility Made From Sturdy, Rip Resistant Denier Fabric Dimensions: Overall: 36 In. (W) x 20 In. (D) x 65 In.(H). Quantity Discount Is Available. Double-door Wardrobe makes a great addition to any home with storage issues. This storage cabinet is equipped with double heavy duty doors and two drawers at the bottom. These pull-out drawers are large and offer ease of access to items stored inside. 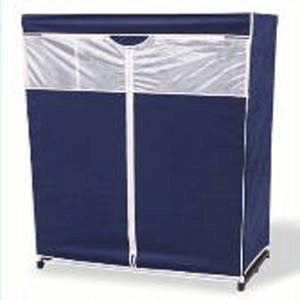 This Honey-Can-Do wardrobe features a durable steel frame enclosed by a non-woven neutral beige cover to protect your garments. This garment cover is made from a breathable fabric that goes a long way in keeping your clothes always fresh. Durability is not a problem as this sturdy steel frame wardrobe efficiently resists rusting. Primary Color:	Beige Shipping Weight (in pounds): 28.9 Honey-Can-Do Double-door Wardrobe with Two Drawers: Breathable fabric cover keeps clothes fresh Two pull-out drawers provide easy access to stored items Heavy-duty steel frame is sturdy and rustproof Versatile storage area is perfect for laundry room, garage or basement Size: 44 In. x 19 In. x 71 In. See through crystal clear extra storage closet. Completely covered with heavy duty plastic and front zipper. Closet has bottom shelf for shoes, hats etc. Stationary unit measures 19.5-Inch by 60-Inch by 64-Inch. Product Description Looking for extra space to store your clothes and shoes? This 60 In. rolling clothes closet is a great solution for any room in your home. Features a strong and durable tubular steel frame; crystal clear cover with a breathable black polypropylene top panel to keep clothes fresh and clean; sturdy corrugated plastic bottom for additional shoe or box store; and wheels for ease in movement. Wipe clean with damp cloth. Imported. 64H x 60W x 19-1/2D In. Portable Storage Organizer with Shoe Caddy. Strong construction. Easy to assemble. Available in Navy Blue, Black and Cream Color.In Stock. Normally Ships within One to Two Business Days. Discount Available For Product and Shipping On Large Orders. Clear Front Portable Closet with Side Shoe Caddy. Easy to assemble. Strong Construction. Available in White and Navy Blue. Wardrobe. Very easy to assemble. Flexable canvas material. Size 30 In. x 20 In. x 63 In.(H). The color is Brown with Cream stripes. 36 Inch Portable Storage Wardrobe. Dustproof Storage. Extra Storage Space For Garments. Available In Black, Navy Blue and White. Easy Assembly No Tools Required. Size: 36 In. X 19 In. X 63 In. *In stock. This product normally leaves our warehouse within 1-2 business days. * Quantity Discount Available. 48 Inch Wide Portable Storage Wardrobe. Dustproof Storage. Extra Storage Space For Garments. Space-saver Storage Closet With Metal Shelving. Very Strong Metal Frame and non Woven Fabric Cover. Very easy to assemble. Available in Navy Blue or Beige Color.Size: 48 In. (W) x 18 In. (D) x 70 In. (H).In Stock. Normally Ships within One to Two Business Days. Discount Available For Product and Shipping On Large Orders. Storage Wardrobe Cart On Wheels. Has lots of pockets for storing shoes or small articles. Shelves for storing clothes and a rod. Strong Construction. Easy to assemble. The front stays open.Size: 18 In. (W) x 17 In. (D) x 48 In. (H)Normally Ships in 1-2 Business Days. Discount Available For Product and Shipping For Large Orders. 60 In. Wide Portable Storage Closet with side Shoe Rack.. Available In Three Colors: White, Beige And Blue (Not Clear As Shown). Easy To Assemble. Breathable Cover Keeps Clothes Fresh. Non-woven Cover with clear Window. Heavy Duty Steel Tubing. Plenty Of Room For Suits, Dresses, Jackets & Skirts.Size: 60 In. (W) x 63 In. (H) x 19 In. (D) Quantity Discount Available. Expand Your Closet Space with this Closet Organizer. White storage wardrobe stores and protects clothes . Portable Storage Closet With Wheels. This Closet Features A Dust Proof Storage Cover.